The NMMI Business Office has a website which covers additional information on NMMI cadets. Actual charge information, financial advisor listings, infirmary and on-line payment information are key links on this page. Use your back button to return here. Tuition, fixed fees, uniform fees, room, board, laundry (limited to specific number of items each trip) and other fees as listed on the applicable cost sheet, which can be found at http://www.nmmi.edu/business/, are charged each semester. Fall payment deadline is on or before August 1. Spring payment deadline is on or before December 31. A monthly statement itemizing all charges will be forwarded to the responsible party around the tenth of the following month. Cadets requiring personal items, school supplies or replacement uniform items may purchase these at the campus cadet store. The cadet store accepts debit and credit cards as well as the Bronco BuX card. More information on the Bronco BuX prepaid spending plan can be found at https://nmmi.campuscardcenter.com. Other alternatives include local bank accounts, maintaining home town bank accounts, ATMs, mailing funds directly to the cadet, etc. Money orders may be purchased from the cashier in the Business Office. Deferred Payment Plan - There are payment plans available for paying tuition and fees (Some charges noted above may not be deferred). A fee is charged for this service. Under this plan, a deposit is required for Tuition and Fees. This initial payment is followed by monthly payments and can be made by cash, check, credit card or on-line at http://www.nmmi.edu/business/index.htm. If a deferred payment plan is established, but is not adhered to, the cadet is subject to dis-enrollment from school for non-payment. Credit Cards - The Business Office, Cadet Store, and Golf Shop will accept VISA/MC, American Express and Discover cards. The credit cards will be accepted for total or partial payment of Tuition and Fees and payments can also be made on-line. The Cadet Store and Golf Shop will accept the cards for purchases. Cash advances are not available. Wire transfers may also be used and wire transfer information is available through the Business Office. Financial Responsibility - At the end of any semester, any cadet whose accounts have not been paid in full will not be eligible to re-enroll for the subsequent semester. NMMI reserves the right to dis-enroll or cancel the registration of any cadet who fails to pay, when due any indebtedness. Credits, transcripts, and diplomas will be withheld until all financial obligations are met. Classes cannot be scheduled for future semesters either..
All current cadets and accepted applicants will automatically receive scholarship consideration. Institutional scholarships will be credited to the recipient’s tuition account on Friday of the third week of classes. Cadets who have withdrawn from NMMI for any reason prior to Friday of the third week of classes will not receive scholarship funds. If a cadet withdraws from school for any reason during the first semester, the cadet may not be entitled to the scholarship if the cadet is re-enrolled during the same academic year. ROTC scholarships are administered under policies provided by the US Army and will be credited to recipients’ accounts upon receipt. There will be no refund for certain fees charged to the cadet. Please refer to the Business Office policies for these non-refundable fees. No refund will be made for uniform items which have been altered, laundry marked or worn. Please allow four to six weeks to process your account. Enrollment at NMMI is in itself not sufficient to change residency, and NMMI will classify a cadet based on their residency at the time of admission. Per state law, any action which will bring into question residency must be resolved. Legal residency is the person’s permanent home, which requires a physical presence coupled with an intent to remain and make that location/state one’s permanent home. An individual only has one residence at a time, and retains the former residence until all items are met in the new residence (license, voting, home, living expenses, etc.). At the time of first enrollment, residency is determined by the census date and anyone not meeting residency requirements will be classified as a nonresident. An individual’s classification remains as determined at first enrollment, as long as the cadet is a continuing cadet, unless the Registrar’s Office has knowledge of a circumstance calling for a reclassification. 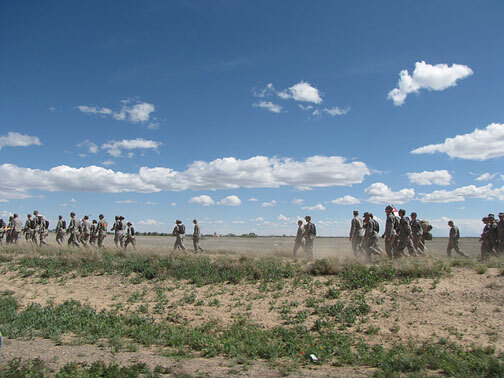 An individual is considered a resident if the cadet has lived in New Mexico for over one year (NM physical location). An individual may become a resident of New Mexico through certain steps, but must complete those steps with one year residency before the cadet’s status changes to resident. NM HED site has the NM State Law on residency information, petitions and exceptions to the law. Persons under 18 are considered minors under NM law and the residence is presumed to be the same as their parents’. Cadet must be at least 19 years old to establish residency apart from their parents. Only individuals who are financially independent may establish residency, and if the cadet is under the age of 23, a copy of the parents’ 1040 or 1040A US income tax form will be required to show dependency status in the previous tax year. Twelve consecutive months residence in New Mexico. Financial independence to establish residency (see above). Written declaration of intent to relinquish residency in any other state to the Registrar’s Office. No act inconsistent with being a NM resident, e.g., voting in another state. Waivers granted by the Board of Regents. NMMI enrolls a number of cadets who drill with National Guard and reserve units (six-year or longer contracts) making them eligible for Chapter 1606 VA benefits. NMMI also grants credit for basic and advanced training, and for certain MOS training applicable to NMMI coursework. Chapter 30, 33, 35 and 1607 benefits are also available. In all cases, cadet will submit a request for benefits application directly to the VA (gibill.gov website) and NMMI will submit the educational information directly to the VA for the benefit. Except for Chapter 33 benefits, monies are deposited directly to the cadet according to the cadet’s VA application and the cadet (and/or parent) is responsible for all fees/expenses to NMMI. Chapter 33 pays tuition and fees directly to NMMI and the remainder (books and living expenses) go to the cadet. NMMI asks for (as applicable), the application to VA, DD 214’s, contract, NOBE and the Certificate of Eligibility before submitting the educational portion of the record. If a cadet has attended another school prior to NMMI, they have the first semester to get a copy of their official record from the previous institution. If the cadet does not submit the previous education records after one semester, we will not submit future VA certifications for the cadet.